Responsive design is seen as a method or technique for reflowing content so that it fits the screen. But there’s more to it than that. Ever since we “went digital” designers and developers have been chasing pixel perfect replication. It did not matter whether it suited that screen or the person viewing it, it had to be consistent. In fact, it had to be identical. It was a fool’s errand. The variants of the technology were always too high, from screen size and screen resolution, gamma & color profile, down to OS & browser version. Things never displayed exactly the same. On top of this you have the person viewing it. Do they have vision impairment? Do they use assistive software? Or do they simply have a slightly different cultural understanding of what you mean when you use a particular color or phrase? This attempt at a perfect reproduction is the result of concentrating on the artifact instead of the people who will be using or experiencing it. And being artifact-centric doesn’t help enough people. To improve this, the people who will utilize the artifact need to be placed at the center of the decisions on how the thing is made and distributed. After all, the artifact isn’t the point: it’s what it triggers and the actions taken that really matter. This realization is in many ways behind Mobile First and Responsive Web Design thinking. Mostly, responsive design is seen as a method or technique for reflowing content so that it fits the screen. But there’s more to it than that. The real leap forward is not in the technique but in breaking away from the perfectly reproduced artifact and concentrating on maximizing the usefulness. Think about the value it provides for the person, whenever and wherever they interact with it. 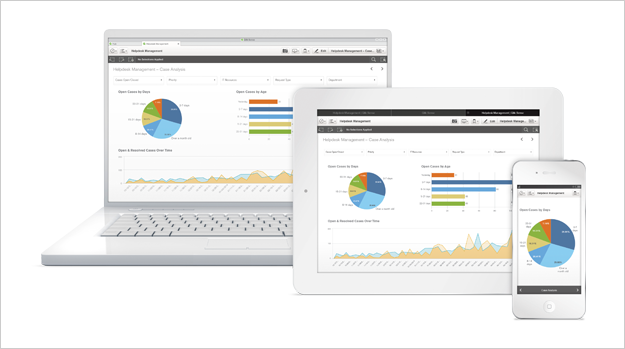 My favorite example of this in Qlik Sense is the responsive charts. We don’t ask the person building the chart to make multiple versions to display at different screen sizes and resolutions. You create it once, keeping the focus on the content and usefulness rather than the artifact and distribution. Qlik Sense adapts the content and renders the chart in the best way to suit the available space, retaining the chart’s meaning and integrity. If it’s a small space we show hints and a suggestion of the shape, reducing the noise and erroneous parts so that the information sent is as strong as possible. When viewing these small charts it’s all about information foraging and spotting that indicator that says “look here, this is interesting”. Give the chart more “space” and more is revealed. The same key content is there but you see progressively more detail, enriching the chart with more information and tools for taking your inquiry further. This helps the chart be meaningful across a wider range of contexts and uses, without the creator needing to think about them all up front. It enables content created in Qlik Sense to move seamlessly through an organization and reach the people at the edges not just the ones whose desktop system is the same as the content creator’s. It’s ultimately about getting the most value from a thing by realizing its maximum utility. Delivering usefulness and value to the most people whenever and wherever they are. And it’s all thanks to a shift away from thinking about the artifact to instead concentrating on the people using it.